Like we see it ! : Luck? 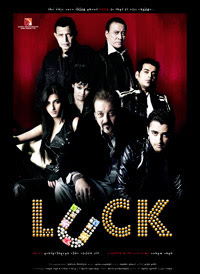 Happened to view the trailer of 'Luck' on TV and was stuck by its similarity to a couple of movies I watched. This movie has a huge star cast including Imran Khan. The movie appears to be a tale of people trying out their luck to win a bonanza with their life at stake. The trailer seemed to have scenes very similar to Intacto and there seems to be a direct copy from the classic 13 Tzameti of the intense Russian roulette circle scene. While Hindi movies are becoming more experimental and varied in story, some originality could help I guess. Anyway, lets wait for the movie to come out and then see...if it is worth watching.